Focused on austerity, the government appears to be ignoring tax policies that have the potential to bring in billions to the provincial treasury. The ruthless slashing of public sector funding – including the current freeze on base funding to Ontario’s hospitals – appears to be more ideologically based than on sound economic policy. As we have previously noted, cutting public spending also creates a fiscal drag on the economy. Public sector workers spend their earnings in the community, generating economic activity. When government puts the squeeze on them, it puts the squeeze on everybody by reducing economic growth. We have seen how both the Harris and McGuinty governments reduced revenues by slashing the corporate tax rate. Less discussed are substantial exemptions to the Employer Health Tax (EHT), introduced in the late 1980s to replace the previous OHIP premiums. When the EHT was introduced, it featured a graduated rate structure – the only one of its kind in Canada. For employers with annual payrolls of less than $200,000, the rate was 0.98 per cent. For employers with more than $400,000 in payroll, the rate increased to 1.95 per cent. Dalton McGuinty is threatening to pull the plug on his own government after the opposition parties amended his budget bill yesterday in the legislature’s finance committee. Like the Harper government budget bill, the McGuinty government inserted a large number of legislative amendments to create a massive omnibus bill. Many of these the NDP and Conservative opposition stripped out yesterday with their 5-4 majority on the committee. Among them is the controversial Schedule 28 which would give the government enhanced latitude to privatize public services without returning to the legislative assembly for debate and approval. McGuinty claims the Schedule is to facilitate the complete privatization of ServiceOntario, itself a mistake. High-profile lawyer Paul Cavalluzzo accompanied OPSEU President Warren (Smokey) Thomas to the legislative committee last week to point out that such privatization potentially opens up serious privacy concerns given U.S. subsidiaries would be forced by American law to share sensitive information gathered by ServiceOntario with the American government. David Orazietti does protest too much. Of course, prior to the NDP holding their feet to the fire over passage of second reading of the budget bill, the McGuinty government had failed to hold its own public hearings on the budget, an unusual state of affairs particularly given the significant austerity package cobbled together by Finance Minister Dwight Duncan. If we are to suddenly change directions, should the public not have a say in what transpires? This month the government announced 900 new nursing positions to come from their 2007 commitment to 9,000 new nurses for the health system. Among them are 144 nurses who will go into the schools to support early identification and intervention of students with potential mental health and/or addictions issues. The nurses will assess and develop plans of care, provide direct service for mild cases, and offer support and referral for more complex issues. What’s particularly interesting about this initiative is these nurses will be working directly for the Community Care Access Centres, the first new hires to provide direct care since Bob Rae was in the Premier’s seat. When Mike Harris changed the NDP’s multi-service agencies into the CCACs, he insisted that a strict purchaser-provider split exist, hoping to divest all direct care workers to private agencies. 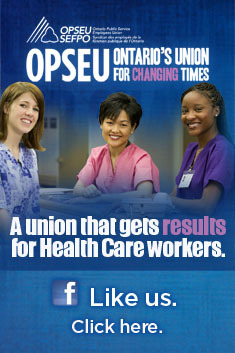 He never entirely succeeded – OPSEU still represents CCAC home care therapists that were supposed to be divested by 1998. The fact that the government has placed these nurses into the employ of the CCAC is a hopeful sign that the terrible Harris-era competitive bidding process may quietly be coming to an end. While Deb Matthews publicly said competitive bidding would return, OPSEU members are telling us the agency contracts are all being extended again. A zero base budget for hospitals is forcing many administrators to look at novel ways to make ends meet. In Windsor much has been made about Finance Minister Dwight Duncan’s proposal for a very expensive mega-hospital, however, the two hospitals are looking at integration options that might save money in the meantime. Windsor Hotel Dieu is pushing for greater coordination of surgical departments with the Windsor Regional Hospital. Facing a $700,000 operating room budget deficit, Dieu is hoping costs could be saved by having the two hospitals move into even greater specialization than currently exists. Dieu presently specializes in trauma and neurosurgery while WRH does most of the pediatric surgeries. WRH CEO David Musyj told the Windsor Star he was cautious — concerned that Hotel Dieu’s financial problems could put more pressure on his 11 operating rooms. Our friends at the Council of Canadians are under attack by the Harper government for encouraging Canadians to overturn elections of seven Tories elected in ridings involved in the so-called robocall scandal. According to the Ottawa Citizen, the Federal Tories hope to overturn lawsuits that seek new elections in the ridings. The Tories are basing their bid to throw out the lawsuits on an obscure and ancient legal prohibition against “champerty and maintenance,” which the Citizen describes as “meddling in another party’s lawsuit to share in the proceeds.” While the Council of Canadians would not stand to gain anything monetarily from the actions, the Tories highlight a Council fundraising campaign that notes the challenge among its work. Of course the Tories have no problems with right-wing organizations, many with American funding, helping to litigate against such left-wing institutions as Medicare. That includes the Canadian Constitution Foundation, an extreme right-wing group based in Alberta that supported Lindsay McCreith and Shona Holmes in their 2007 case intended to open up Ontario to two-tier private health insurance. While the CCF doesn’t say where their money comes from, they do specifically note on their website that they have charitable status with the U.S. Internal Revenue Service. Like the Council of Canadians, the CCF lists its McCreith/Holmes case as among the worthy activities it undertakes to solicit donations.